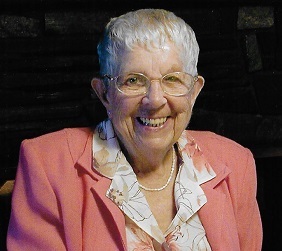 Eastlake resident, Joy Angelberger Lundblad, age 96, joined her loving husband "Jimmy" in heaven on January 5, 2019 after a brief illness. She was born Dec. 19, 1922 in Cleveland, Ohio. After high school, she worked at Picker Xray where she met her future husband Jim. She and Jim joined the Armed Services during WWII, where she served in the Navy and he in the Army. Before her husband left to fight overseas in Europe, they were married in Texarkana, TX. Joy was stationed in Washington DC where she worked in decoding. In her spare time while there, she took flight training in a Piper Cub and received her pilot's license. Joy was a proud active Veteran throughout her life. After the war, Joy and her husband built a home in Mentor where they raised four children. She later worked for Mentor Schools, taught Sunday School at Mentor Methodist Church and was a Girl & Boy Scout Leader. Nearing retirement, Joy and Jimmy purchased and operated a family resort called "Little Sweden" on Lake Vermilion in Cook, MN. They enjoyed many years up North before returning to Northeast, Ohio. She was preceded in death by many relatives including her husband Jimmy and her grandson Brandon L. Williams, her sister Dorothy Montgomery and brother Ralph Angelberger. She is survived by her four children: Dale (Nan), Janice (David) Williams, Joy Karin and Charlie; three Grandchildren David (Lauren) Williams, Ashley (Jon) Bishop and Charlie Paul Lundblad; her Great-Grandchildren Emilia Williams and Graeme Bishop; along with nieces, nephews and dear friends. Her whole life was active, adventurous and fiercely independent. She was a wonderful mother and role model with her big smile and friendly personality. She especially loved her road trips to Minnesota, going out to eat and flying with her daughter Joy. She also proudly attended the Honor Flight Program last year in Washington DC to honor all Veterans in what she described as one of the most memorable days of her life.